This was one of the homemade gifts I made for Christmas this year. I thought I would share the recipe. I have Witch Hazel to use up. So, that is why this recipe has it in it. But after the Witch Hazel is gone I will be going a different route. Fill your 1 oz glass bottle 1/2 way with water. Sit glass bottle on counter top. 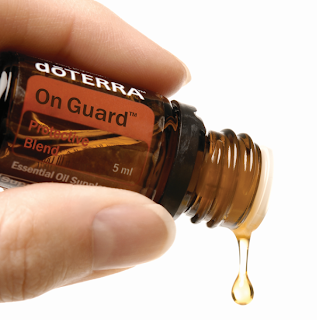 Carefully drop 8 drops of your On Guard essential oil into the 1 oz glass bottle. Put lid back on On Guard (this is like liquid gold and you don't want to accidentally knock it over). Then using a sanitized straight pin, poke 2-3 holes into your Vitamin E gel cap in the same location and squeeze the gel cap over the glass bottle, allowing the Vitamin E drops to fall into the glass 1 oz bottle (if you squeeze to hard and the gel globs out all at once, that is ok, just gently run your finger over the top of the glass bottle allowing the Vitamin E to drop into the glass bottle). Then place your small kitchen funnel carefully into the top of the 1 oz glass bottle. Slowly pour the 1 tsp of Lemon Witch Hazel into the funnel. Lastly, pour a small amount of water through the funnel, making sure you don't waste any of the Lemon Witch Hazel left in the funnel. Then add water (either through the funnel or by carefully pouring it into the bottle) filling the glass bottle to the bottom of the neck of the bottle. Place sprayer on top of glass bottle and tighten. Shake well. I gave these away for Christmas presents and have one in my purse. To use: Spray liberally on hands and rub together. Repeat as needed. *When you are purchasing Vitamin E oil, just make sure the label says that the oil is safe for internal consumption. You can buy a bottle of oil, you don't have to but the gel caps. When a product is labeled "not for internal consumption" the manufacture is not confident and is not standing behind the health and safety of this product to be used internally. Well.....when we are putting hand sanitizer on our hands....where does it go???? Into our bloodstream (absorbed through the skin), thus far we ARE using it internally. So just we are careful here. Such a beautiful and amazing oil. My kids get 2 drops on the bottoms of their feet every morning and every evening during cold and flu season. Amazing oil! And, of course if you are interested in learning more about doTERRA essential oils, please contact me or visit my website at www.itstimetogreen.com and click on the doTERRA link.